Some dog breeds, like the German Shepherd, can be a handful when training to walk on a leash while others can continue to be pullers even when they are fully grown dogs. Even small dogs– whether you have a German Shepherd puppy or toy poodles–can benefit from no-pull dog harnesses. A no jump dog harness or lead can help take the strain off their neck every time your dog pulls. If you have a dog that is always pulling against the collar and lead they are on then the wheezing sounds they make can be quite distressing. Also, it is of course hard on their body. Scout knows that it can be hard to find good no-pull dog harnesses or leads, so the team has put together a list of some of the good ones out there to save you time while you teach your dog to stop pulling. Are You and Your Pooch Ready for a Fabulous Trip to the Dog Park? 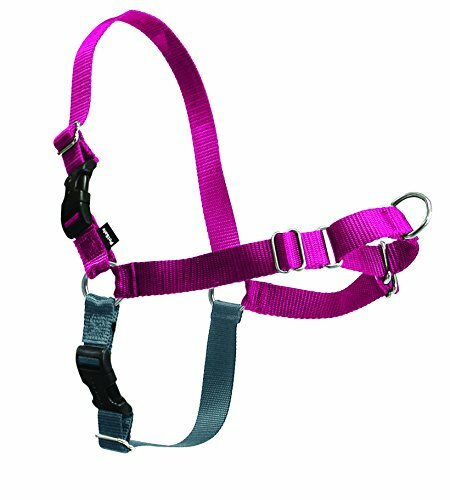 Look for harnesses that are highly adjustable in many areas. Just like people, various dog breeds are made in all shapes and sizes. If your dog is at the borderline for one size or on the stocky side, go for one size up (as long as the leash is adjustable). Pay attention to signs that the no pull dog harness is not fitting correctly, like rubbing or any raw looking spots. Hopefully, you can spot these before they increase in severity on the first walk. A big dog can exert a lot of force if they are pullers! Make sure that the lead you are buying has a good weight rating as to not strain your pooch’s legs. If you put a 120lb dog on a lead designed for one that is 60lbs then you are asking for trouble. This basic easy walk harness offers a high level of adjustment while keeping a minimal profile. For dogs that don’t like to wear a no-pull harness that covers a lot of their body, this can be the best option. Scout likes that there are a lot of sizes and colors available to suit any dog! This 3M reflective vest style no-pull harness offers sturdy nylon adjustable straps. This is a good vest for those that want a high degree of visibility as well as control. The no-pull harness vest is easy to size, put on, and has adjustable straps. When you want to take it off, just undo the sturdy buckle clips with a simple click and you are good to go. Two different leash attachment points allow you to customize the control you have over your dog. EXPAWLORER Best No-Pull Dog Harness. 3M Reflective Outdoor Adventure Pet Vest with Handle. 3 Stylish Colors and 5 Sizes. 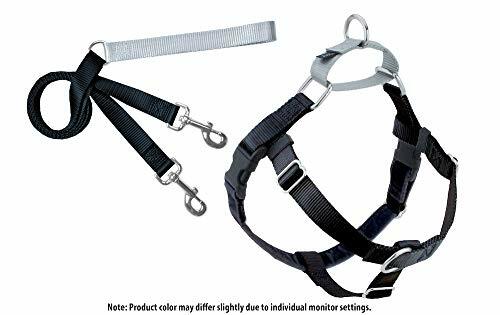 If you are looking for a high visibility no-jump harness that is comfortable and rugged then this no-jump harness is just what you need to hit the trail with your pooch. Soft mesh and padding make this harness well ventilated while being very comfortable to wear on extended walks and trips. The handle on the top makes it easy to secure your dog when they are riding in the car. Two different leash points, one on the chest and one on the back, offer you the security and control you need for an excitable pooch! 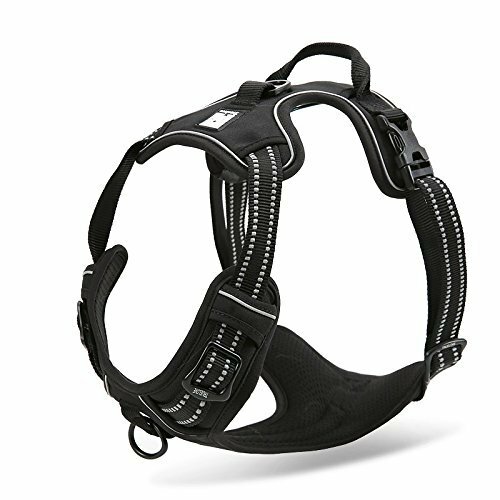 This anti-jump harness is a great choice for those on four legs and on two. 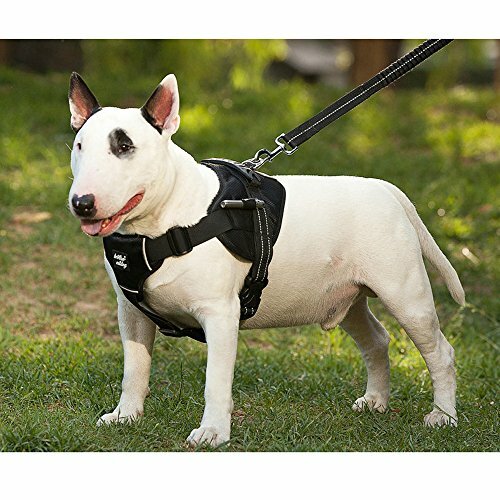 This beefy no jump dog harness is ideal for those that want a heavy duty harness that allows for ultimate control, even when your splendid pets are being less than delightful. The attachment on the front chest area discourages pulling or you can just use the back attachment for casual walks. For extra control and training, you can use both attachment points. 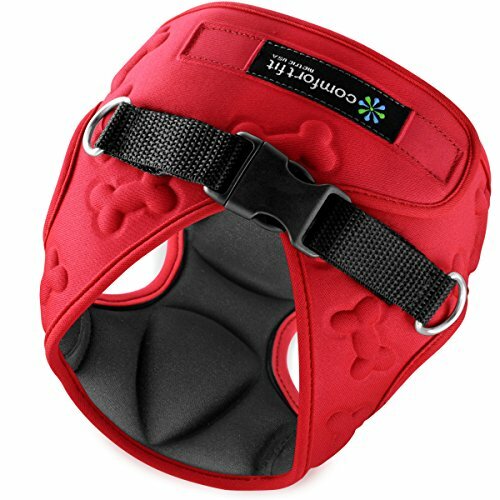 The velvety inner lining of this no jump dog harness makes it very comfy for any dog to wear and it will not dig in and cause marks or abrasions. Scout likes that it comes in sizes to fit dogs up to 200 lbs! Veterinarians like this design because it helps dogs to walk straight which is better for their back over time. 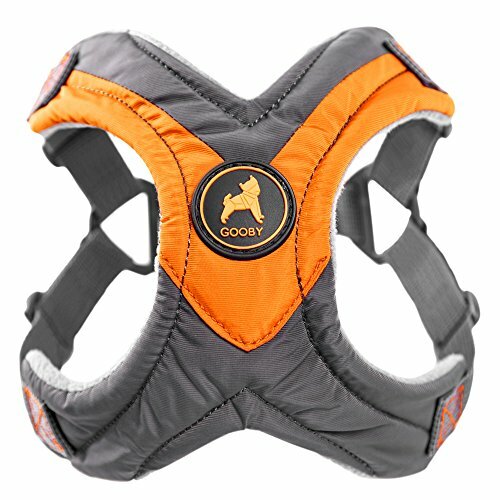 This outdoor adventure grade vest style dog harness is reflective and padded for your pooch’s safety and comfort. Whether you’re on an adventure or trying to teach your dog to sit, the outer material is durable and made to resist scratching and wear and tear that can happen on outdoor adventures. The lightweight buckles and straps make for easy adjustments. The simple two-buckle on-and-off design means your dog is easy to get ready for a trip to the trail or park. Dog parents can choose from seven colors and five sizes, so there is an option for every dog in the family. 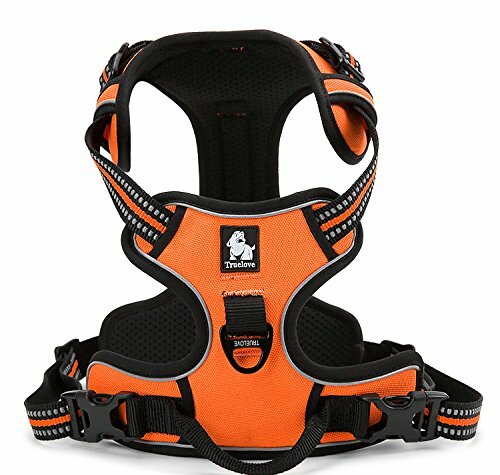 This large anti-jump dog harness is padded and quadrupled stitched for strength and durability. The reflective material and handy flashlight stash point make this an ideal vest for those that walk their big dog in busy places or under low light conditions. A grab handle on the back makes it as simple as reaching down if you need to restrain your big dog more than usual. The leash attachment is on the back. There is no other attachment point. 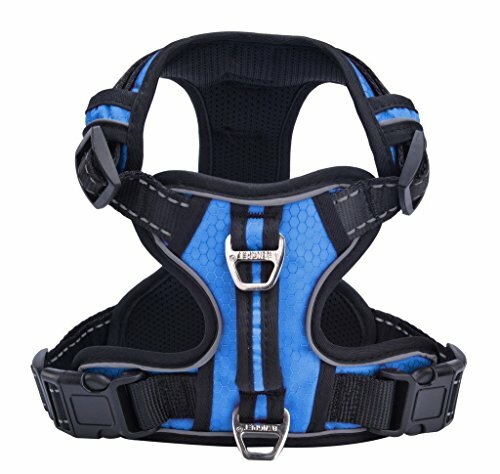 For really big dogs with large chests, this is a great no jump dog harness to invest in. This harness is heavily padded and made tough to stand up to the strain and abuse a big dog can put on it. A sturdy reinforced grab handle and D-Ring make this a heavy duty dog walking solution. Several colors are available and all have a reflective stripe that is appropriate for long walks in town where visibility is a constant concern on busy streets. Easy to Put on and Take off Small Dog Harnesses Our small Dog Harness Vest has padded Interior and Exterior Cushioning Ensuring your Dog is Snug and Comfortable ! If you want to have a little more control over small dogs and medium dogs, then this cute vest offers a lot of style, and it is comfortable for them to wear. This harness is only available in sizes from XXS to Medium. The cute puffed paw design fabric is durable and breathable and comes in 4 fun colors to reflect your dog’s unique style and personality. This is an affordable anti-jump harness that matches perfectly with your favorite dog leash. For those that want maximum durability and visibility, there is the EzyDog harness. This harness for dogs on the go comes with a free seatbelt clip with 11 fun colors and sizes to fit teacup dogs to giants! The easy quick-release system makes this a harness that you will never struggle with. The welded steel D-ring makes for sturdy attachment and control of your dog. Foam padding on the harness allows your companion to be comfortable during long walks and bike rides. If you want a supreme level of comfort for your dog then it is hard to go wrong with memory foam. 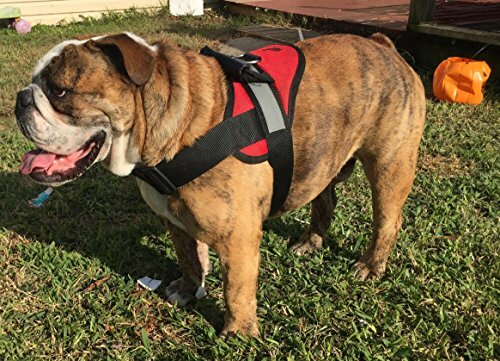 This vest-style harness is fleece-lined and features sturdy plastic rings. The step-in harness style is easy to use and ideal for small to medium dogs. Many dogs prefer the step-in approach, as they dislike having things put over their head. The largest size of this harness will fit a pooch that weighs 30 lbs. You can choose from five different colors, some of which are clearly visible for those that walk in busy places. In addition to using a no jump dog harness, obedience training is key. Check out the best tips for obedience training in the ScoutKnows Behavior and Training section. As you can see, there are a lot of humane and comfortable harnesses out there that can make it a lot easier to go on those walks to the dog park. Scout hopes that this list has helped you find the harness that is right for your dog. Now on to some adventures in the great outdoors!